Cryptos is a free HTML5 crypto website template. It comes with a lot of up-to-the-minute features and assets namely, drop-down menu, call-to-action button, mega menu, on hover effects, cryptocurrency calculator, parallax effect, back-to-top button to name a few. 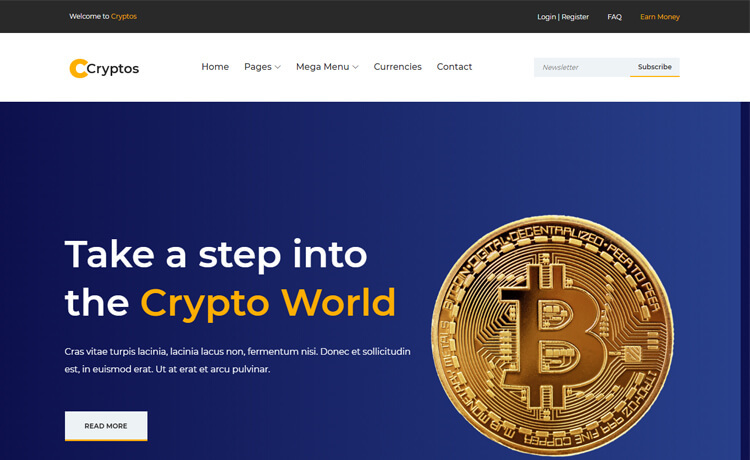 Cryptos is a free HTML5 crypto website template made with Bootstrap 4. Cryptos is a mobile-ready and multi-page website template. Moreover, it is optimized for most of the browsers and is a specially designed theme for crypto and related websites. Cryptos has a classic full-screen slider on the header. Besides, it comes with a lot of up-to-the-minute features and assets namely, drop-down menu, call-to-action button, mega menu, on hover effects, cryptocurrency calculator, parallax effect, back-to-top button to name a few. Cryptos includes a well-managed and well-structured code inside which is flexible to edit also. Create with Cryptos and get a stunning project! Thank you for downloading Cryptos.